Kay Productions\' mission is to create biblically-based products that encourage wholesome fun and provide unique learning opportunities for kids. CJ\'s Closet is a great example of their mission being accomplished! You can get it for $24.95 (shipping included) from their site. With the game you get trading cards, stickers and access to their online fun house. Once online, you have access to more puzzles, games and pictures. Not to mention greeting cards, coloring books, prizes and monitored chat rooms. When you launch the game, you are taken to the main screen. From here you can do interactive adventure stories, games, puzzles, or go to their online clubhouse. In the Game Board area, you can play Water Balloon Gallery and Butterfly Hunt. In the Water Balloon Gallery game you have to shoot the moving water balloons. This will teach your young ones hand-eye coordination. In the Outer Space section you have the following stories and themes: Astro Catastrophe: You will discover that two working together are better than one. Ecclesiastes 4:9 Star Light Star Bright: The theme here is to love others as you love yourself. Mark 12:31 Ton of Bully: This story teaches you to love and pray for your enemies. Luke 6:27 In the Under Water Section you have these adventures: Don\'t Judge a Clam by it\'s Shell: This story talks about not judging others and impatience. Matthew 7:3 Whale of a Story: This story is about a whale fallen victim to his own pride and later apologizing for his actions. Luke 14:11 The last section, Wild West has the following tales: Al that Glitters: This story teaches you not to rely on gold or anything earthly. Matthew 6:19 Bucky Palooka: In this adventure you\'ll learn that people don\'t like it when you brag about yourself. Let other people praise you. Proverbs 27:2 There is so much to do in this game. So many hours of great stories and games to play. You children will learn so much! From a Christian standpoint, I love this game for educating children on biblical values as well as colors, math, reading and history. In many of the adventures you are asked biblical questions or riddles. This is another opportunity for them to learn the bible. 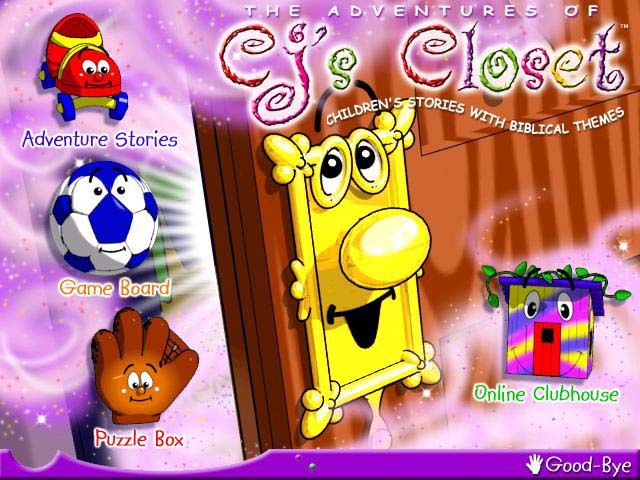 CJ\'s closet makes learning the scripture fun! This game primarily runs off the CD-ROM, so you want to make sure you have a faster model. You will also need QuickTime which comes on the CD if you don\'t have it already. The graphics are nice and colorful. Everything is cartoon like. The voice acting was good and the music was great. For controls you only need your mouse. Make sure your child is familiar with it. There are areas in the game that require you to move a dot through a maze. It\'s a bit of a pain sometimes, but it can be done. I am not sure how difficult that will be for a kid though. The game ran very stable with no crashes. Make sure you don\'t have a lot of applications running in the background, when you do, the game may pause every now and then. I only noticed one error in one of the scripture quotes, I brought it up to them and hopefully they will fix it. Overall I was very pleased with this game. I would highly recommend it for anyone with kids. The age group says 5-8, but there are many games that older kids and adults may enjoy. The sliding puzzles and word searches come to mind. The lessons learned are helpful for any age group in my opinion.